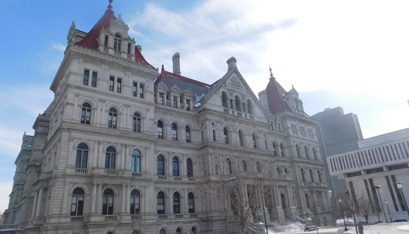 Officials at the New York State Catholic Conference said the Church in New York State is “in a period of a great unknown” following the passage of the Child Victims Act (CVA) by the State Legislature last Monday. Mr. Poust said the state Bishops are hopeful that the bill will bring “reconciliation and healing” to all sexual abuse survivors in the state. But the gravity of the financial impact for that healing, which is expected to be felt largely by the Church, will only become more clear as the next 18 months unfold. “Certainly there will be challenges faced by the dioceses, but whatever financial pain the Church feels from this, pales in comparison to the pain felt by survivors,” he added. The bill is a large expansion of the state’s statute of limitations for cases of child sexual abuse; the age limit for filing civil claims against one’s abuser was raised from 23 to 55. The bill also allows for a one-year window during which victims can come forward to file civil claims, regardless of where or when the abuse took place. Several Catholic dioceses around the country have filed for bankruptcy in states where a retroactive window has passed, allowing survivors to file lawsuits against the Church for some decade-old cases of abuse. Mr. Poust said that the dioceses across the state can expect new lawsuits to surface during the one-year window period. He added that the recovery in the Church won’t be over “next month or next year” because “there is a process of restoring trust” that will take time. “We know there’s a societal problem, and we hope and pray this bill will do for the survivors what compensation programs around the state have done,” said Mr. Poust. The Albany Diocese has provided compensation to approximately 100 survivors of sexual abuse whose cases were beyond the statute of limitations, paying more than $9 million in direct compensation and counseling assistance to survivors. While “no amount of money will heal a survivor of sexual abuse,” Mr. Poust said the Church recognizes “where money can be very beneficial” to financially support the healing process. The CVA passed unanimously in the State Senate. It went onto the Assembly where the vote was 130-3 in favor. The bill had long been opposed by the Church for not including public institutions in the retroactive window. The Catholic Conference was successful in expanding the bill to include both private and public institutions. After the change, the Church dropped its opposition. The CVA was first proposed in 2006, but was held off from passing mainly from a historically Republican State Senate. Outside of a brief two-year period from 2008 to 2010, Republicans have consistently controlled the State Senate since 1960. This year, after gaining Senate majority, Democrats have been pushing through legislation in rapid-fire succession, including the Reproductive Health Act, which passed on Jan. 22, the anniversary of Roe vs. Wade.